Using the physiological single tree growth model BALANCE, vitality of forest stands was simulated in dependence of the site-related factors, climate and stand structure. At six level II plots in southern Germany with the main tree species beech (Fagus sylvatica L.), oak (Quercus robur L.), spruce (Picea abies [L.] Karst. ), and pine (Pinus sylvestris L.), simulated results were compared to measured values (soil water content, bud burst and leaf colouring, diameter at breast height, tree height and crown density) in order to validate the model. Sensitivity tests were done to examine the influence and the interactions of the environmental parameters. 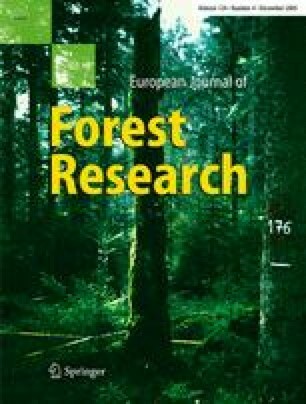 The validation results show that BALANCE is capable of realistically simulating the growth and vitality of forest stands for central European regions for medium term time spans (several years). The validation of the water balance module produces mean absolute errors based on field capacity between 2.7 and 6.9% in dependence of sites and forest stands. Senescence of foliage as well as crown density is reproduced with a correlation coefficient of 0.70 compared to measurements. Differences between measured and simulated diameter values were smaller than 1% for spruce and smaller than 6.5% for beech after 7 years of simulation, and smaller than 1% for oak after 8 years of simulation. On the other hand, the simulations for pine trees conform less with the measurements (difference: 22.6% after 8 years). The sensitivity of the model on environmental changes and on combinations of these parameters could be demonstrated. The responses of the forest stands were quite different. The investigation was funded by German Federal Agency for Agriculture and Food (BLE-00HS041). The basic model BALANCE was developed in the framework of the special research program SFB 607 ‘growth and parasite defence’. The authors are indebted to C. Pitkanen for the contribution in data processing and analysis and T. Seifert for his critical review of the article. The authors thank Bavarian State Institute of Forestry (LWF) for providing the data of the Bavarian level II plots, especially W. Grimmeisen for the soil moisture data and B. Schultze for the actual climate data. Thanks also to German Weather Service (DWD) for providing phenological data.